One pot bacon broccoli mac & cheese! A little bit of naughty, a little bit of nice, and a lot of portion control. That’s my approach to food. So when I decided to make some mac and cheese and put Bacon in it, I knew that I had to at least throw some broccoli in there as well. 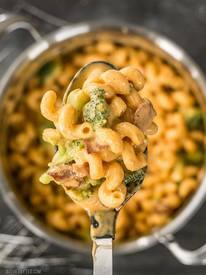 It was a reasonable compromise because Bacon and broccoli go really well together and the broccoli adds some much needed texture in this ooey-gooey One Pot Bacon Broccoli Mac and Cheese.